Sticking To Basics In Overland Park, Kan. : Participation Nation Giving The Basics provides people with toothbrushes, feminine hygiene products and other human-dignity necessities. Sticking To Basics In Overland Park, Kan.
One day Theresa Hamilton, a mother of 12, was struck by how hard it is to come by human dignity when you are down on your luck. For instance, you can't use Food Stamps to buy toilet paper or laundry soap. So Theresa founded Giving The Basics — an organization that provides people with toothbrushes, feminine hygiene products and other human-dignity necessities. Local businesses — including her husband's plumbing firm — are working with Theresa. 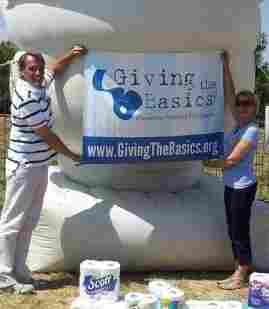 At a recent Shawnee Mission Theatre in the Park event, for instance, patrons donated 370 rolls of toilet paper. Amie Logan works for Bob Hamilton's plumbing company. She listens to KCUR.